Before tearing my ACL for the first time when I was 10, I was a multi-sport athlete competing as a right wing in hockey and a forward in soccer. It was a long time ago, so I�m not sure how true this was, but my parents told me I used to be the fastest kid on the ice and on the field. I was (and still am) small for my age, but I had speed and agility on my side. I then tore my first ACL in my right leg when I was 10 by jumping off of a swing set at school and landing on my knee wrong. I had a relatively new type of surgery for pediatric ACL tears in Boston a few months later, followed by 6-9 months of physical therapy. After about 12 months of being out of sports, I slowly got back into hockey and soccer. Just as I was getting my speed back again, my right ACL tore again (along with the right meniscus which resulted in a bucket meniscus) after taking a misstep trying to catch a basketball in a friend�s driveway. That�s when I went to Dr. Cole for help. After a few weeks of planning, I was back on the operating table, but this time in Chicago. The second surgery went well and I underwent physical therapy again for about 6 months before returning to some sports. While I could still play soccer and hockey, I had been out of the sports for long enough to the point where I was pretty far behind my peers in skill level. I decided to try out new sports like cross country and cycling, and eventually rowing in high school. I joined the New Trier rowing team as a coxswain during my freshman fall. I immediately fell in love with the sport and pursued it for all four years at New Trier, going on to cox the Varsity 8+ boat that won the Scholastic National Championships in spring of 2016 (pictured below). I was then recruited to cox at the University of California, Berkeley for my fours years at college and I am now a freshman here at Cal. We�re now in the thick of our racing season here on the west coast and we�re excited to see what we can accomplish this year after Cal took home the IRA National Championship title last year. I�m very excited to continue coxing here and for getting the opportunity to become a D1 athlete after my injuries, thanks to Dr. Cole. 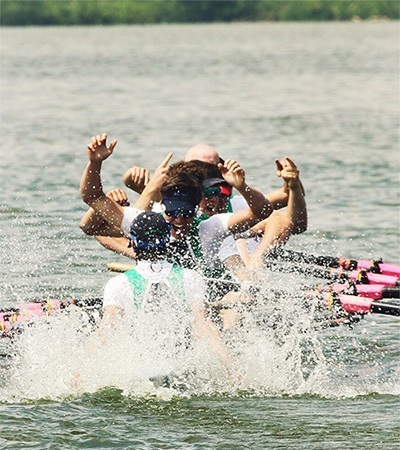 Pictured above: The New Trier Varsity 8+ crossing the finish line at Scholastic Nationals winning gold (2016). 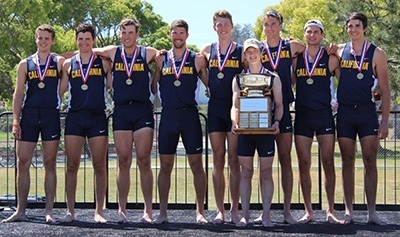 Pictured above: The Cal Freshman 8+ on the podium after we won gold in the Open 8+ event at the San Diego Crew Classic (2017).